Lances and foot controls are the basic tools of water jetting, and NLB offers more choices (with more safety and ergonomic features) than any other manufacturer. From adjustable grips and shoulder supports to trigger/pedal locks and a patented quick-change cartridge seal, NLB leads the way in operator protection and comfort. NLB’s 286 series hand lances and foot control valves are designed for maximum operator protection and productivity. A patented trigger/pedal design (U.S. patent no. 5,636,789) lets you dump pressure immediately by simply pushing the trigger/pedal forward. One of the most popular features of these tools is a unique quick-change cartridge that you can replace in the field in less than 60 seconds. 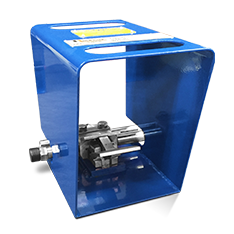 It is available in most models, with operating pressures ranging from 10,000 psi (690 bar) to 40,000 psi (2,760 bar). 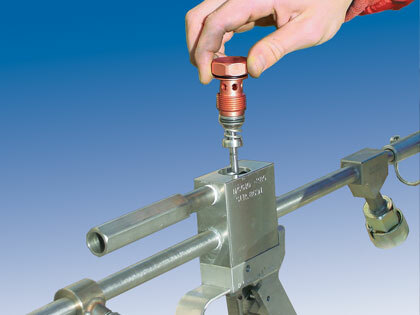 NLB carries a wide range of hand lances for all popular operating pressures. When operators have both hands busy, a foot control valve lets them control the water flow. The VacLance attachments turn any NCG8450A-3 hand lance into a vacuum recovery surface preparation tool. Whip Hoses help protect hand lance operators from potentially dangerous hose failures. Mobile lance stands let operators share the load of holding a pressurized lance, reducing both strain and risk.